Since I am still recovering from last week’s cook-a-thon while gearing up for the Christmas dessert madness to come, kitchen time this week has been pretty simple overall. I’ve been relying heavily on meals that are fast and delicious and most importantly, do not have turkey! This simple and meatless dip is one that I have used as both appetizer and main. It’s hot, fast and cheesy, which is pretty much all I need my food to be. Canned black beans and bagged shredded cheese make this one a 10 minute or under to prep superstar which in my book is gold. Now you have time to focus on the important things of the season, like Christmas movies and sneaking bites of the treats you have made off-limits to everyone else! Serve with your favorite tortilla chips and enjoy! I have used many types of shredded cheeses in this dish including Colby-Jack, fresh shredded sharp white Cheddar and even just bagged shredded orange Cheddar so feel free to experiment with what you love in cheese. Do keep in mind that the dish has salsa so it should have a Mexican-type feel so I would stay away from Mozzarella or Parmesan! The blocks of cream cheese work best in this recipe simply because it is easier to cut them into strips and lay them on the casserole for even melting. If you have a tub of cream cheese you can certainly use it, just be sure you are getting even scoops of it over the beans so you don’t have pockets of dip without the cream cheese goodness! 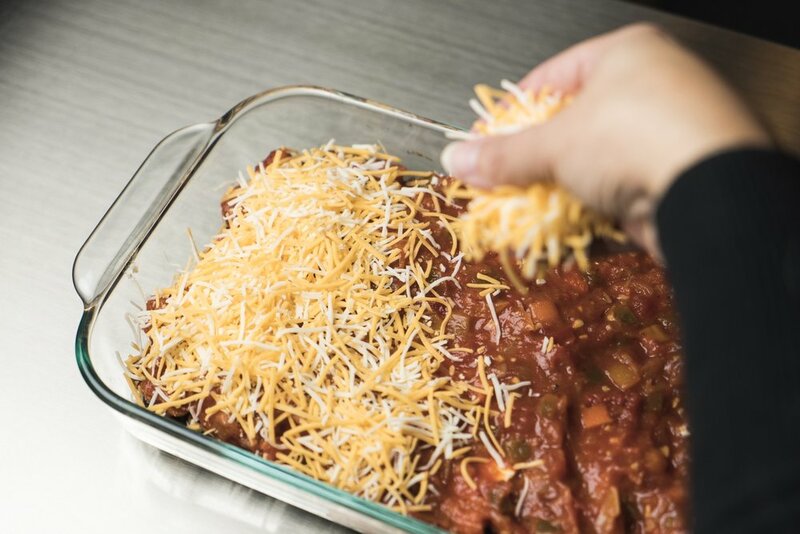 If you anticipate chaos and want to make this in advance, this casserole can be layered and put in the refrigerator for up to one day before you want to bake it. Just add 5-10 minutes to the bake time to make sure everything gets all hot and gooey!